Friends of the Earth and REScoop.eu would like to invite you to the first ever European-wide convergence of citizens working on Energy Democracy. For us energy democracy means any project or initiative that contributes to people’s control and ownership of the energy system, this including but not limited to renewable energy cooperatives. We think we need a gathering like this because different groups, projects and campaigns working in different ways on energy democracy across Europe exist but they are often not well connected outside of the national context. There are also very different contexts regionally, for example in Eastern Europe energy democracy is in the early stages and there is a lot of resistance from the State and corporations. We are hosted in Spain by Som Energia and Amigos de la Tierra, and the Spanish context will provide an important backdrop to our conversations. The gathering will consist of a number of workshops and open spaces as well as inputs and debates with people who are already engaged in energy cooperatives and community energy projects. 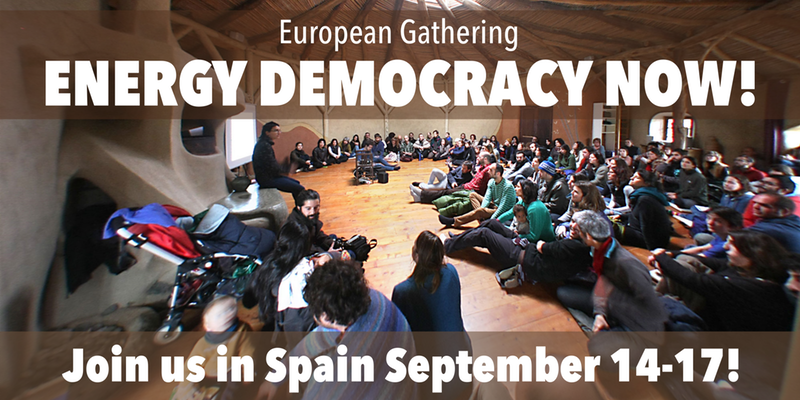 We hope that you will leave the gathering feeling connected to the European movement for energy democracy and with new skills and tools for how to get things moving in your own, local contexts. NOTE: The registration that you can make now is preliminary. As we have limited spaces available we might have to make a selection to get as broad a representation as possible. Final confirmation will be given in the first week of August. But we of course hope to be able to bring everyone interested together! Practical info: There are busses directly to the venue from either Girona or Barcelona. Food and accommodation at the venue will be covered but we are in general not able to cover travel costs. Sleeping will be in either hostel-style dorm accommodation or camping on the grounds of the venue (bring your own tent!). Friends of the Earth Europe gratefully acknowledges finacial assistance from the European Union for the project “School of Sustainablitity”. The contents of this invitation are the sole responsibility of Friends of the Earth Europe and cannot be registered as reflecting the position of the European Union.